A reliable harbinger of the warming days of early spring, the branches of the forsythia bush (Forsythia spp.) bear vibrant yellow flowers when much of the other garden plants are still leafless and dormant. Beautiful as a companion or background to other spring flowering plants like daffodils, forsythia bushes unfortunately look mundane all other times of the year. In winter you see the messy thicket of upright or vase-like branches. Selectively prune the shrub each year to remove the oldest, least-attractive branches and allow younger twig sprouts to maintain the flowering quality of the shrub. Wait until mid- to late spring to prune the forsythia bush. Enjoy the flowering display first and consider any pruning maintenance after the display has ended and before all leaves have emerged and matured to full size. 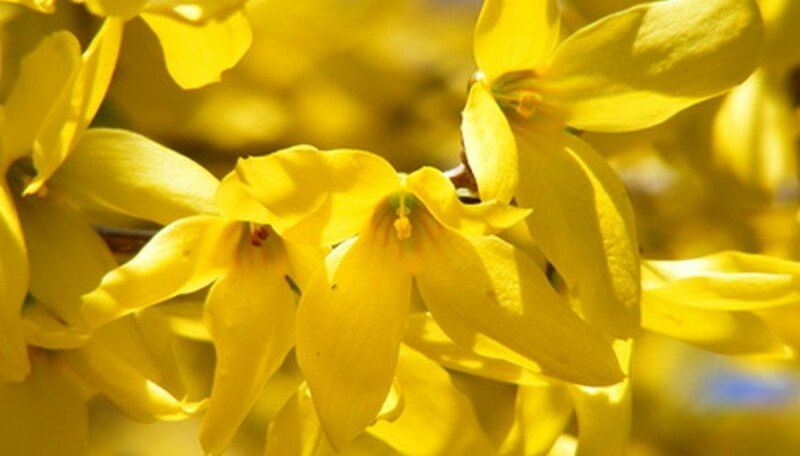 Examine the forsythia bush, noting any damaged, dead or rubbing branches and stems. These need immediate removal. Feel free to snap a branch or mark it with a scraping mark on the bark to help you quickly remember the branches you wish to remove. Make all pruning cuts 1/4 inch above a leaf bud or lower branch junction with a hand pruners. Fully dead stems that reach all the way to the ground can be pruned out, leaving a stump about 4 to 6 inches tall. Use a loppers if any stems or branches are greater than 3/4 inch in diameter. Stand back and look at the structure of the forsythia bush after the dead and damaged branches have been cut and pulled away. Keeping in mind you don't want to remove any more than 50 percent of all branches that rise from the plant base, look for older branches with really fat bases. The really old branches lose vigor and often have a soft corky bark or partially rotted bark at their base. Cut off the oldest branches with hand pruners or loppers at a height of 4 to 6 inches above the soil line. Removing these encourages growth of newer sprouting stems to replace the old, decrepit looking branches. Remember, you don't want to remove more than 50 percent of the branches that existed in the forsythia bush at the start of the day. This selective but restrained technique is called "thinning" and results in healthier regrowth, according to North Carolina State University. Casually trim back any errant or irregular branch tips to create a more balanced, well-rounded form on the shrub. Do not shear the branch tips so the plant physically has a perfectly globe-like shape. This unnatural-looking form will look particularly awkward in the winter after the leaves fall and next spring with the strange pattern of flowering. Allow the forsythia bush to grow unpruned the rest of the growing season and across the winter. Enjoy the better flowering in spring and then repeat the partial, selective pruning of the damaged, dead or overly old and woody branches after flowering. This pruning cycle continues each year as long as you wish to keep a forsythia in your landscape; over the course of two to three years you renew/replace the plant's branches in staggered increments. Some people choose to prune their forsythia shrubs in late winter and bring in heavily budded waste branches and force them into bloom. You simply place the fleshly cut twigs in a vase of cool water in a cool, bright room and watch the flowers open over several days. Although coppicing, or cutting off all branches to the ground every year is easy to do, it inevitably creates a forsythia shrub with many linear stems that yield few flowers according to Cass Turnbull on the Plant Amnesty website. The straight stems may look nicer across winter but come the spring, the flowering display is disappointing. Focus on cutting out only the oldest, largest stems and allow younger root sprouts to replace them.